We were the invincible arm of the Lord's wrath. For 81 days in the summer of 1944, Staff Sergeant Lafayette G. Pool of the 3rd Armored Division and the crew of his M4 Sherman tank “In the Mood” terrorized German armored formations, destroying 258 armored vehicles including a dozen Panther tanks, taking over 250 prisoners and killing at least 1,000 enemy soldiers. It's a record unequaled in World War II and unlikely ever to be matched. Pool, a six-foot-three Texas farm boy, boxed his way through his teenage years in the Golden Gloves circuit and entered Texas A&I University as an engineering major after the Navy refused to accept him due to a boxing-inflicted eye injury. He dropped out of college to enlist in the Army in June 1941, and went to the newly-formed 3rd Armored Division in Louisiana. Pool trained hard, both in the ring and in the field. Division boxing champion, he won the Army's regional belt as well and received a bid to fight in the national championships, but turned it down because his division was slated to receive the new M4 Shermans and he did not want to fall behind his battalion's other tank commanders. 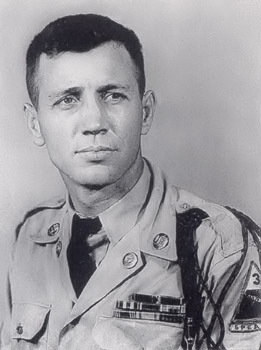 Newly promoted to staff sergeant in 1943, Pool similarly turned down a chance to attend Officer Candidate School, preferring to drill his crew and prepare for combat. The crew he picked remained together throughout his combat service. They referred to him as “War Daddy,” as he'd reached the advanced age of 25; he in turn called them his “Pups.” The Pups included 17-year-old bow gunner Bert “Schoolboy” Close, driver Wilbert “Baby” Richards, loader Del “Jailbird” Boggs, who had chosen to enlist rather than face a sentence for manslaughter, and gunner Willis “Groundhog” Oller. Third Armored Division moved to England in September 1943, and Pool continued to both train his crew and box. In Liverpool he fought an exhibition bout with heavyweight champion Joe Louis, in which Pool apparently became over-enthusiastic. The annoyed champ flung his arm around Pool. “White man,” he informed the sergeant, “I'm going to give you a big lesson,” before thoroughly pounding the tall Texan, who was bloodied but still on his feet at the end of the round. This appears to be the third In the Mood. The Spearhead Division entered combat on 27 June 1944, and Pool faced bigger and stronger opponents like the Panther tank the same way a smaller fighte takes on an opponent with a longer reach: get close to them and hit as hard as you can, as fast as you can. 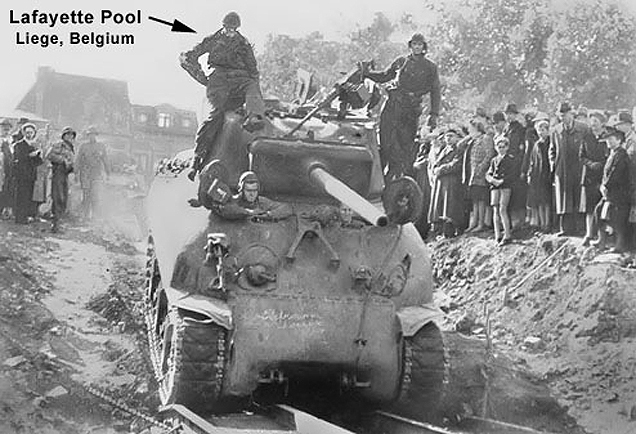 Pool's first “In the Mood” was an M4A1 with a cast hull and 75mm gun, and in their first action Pool claimed three German armored vehicles. Two days later, a German infantryman with a Panzerfaust anti-tank rocket hit In the Mood; the crew bailed out safely but the tank was a total loss. 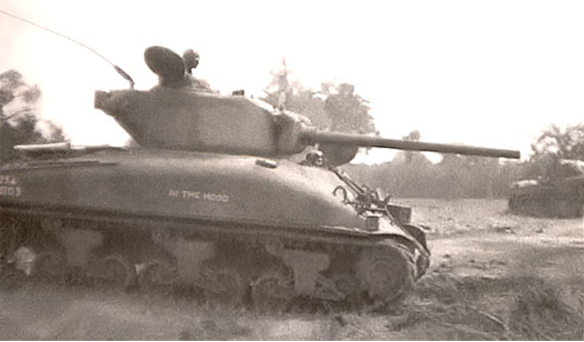 Pool and crew soon received a new tank, which he also christened “In the Mood.” The new In the Mood was one of the first Sherman M4A1(76)W vehicles received by the Spearhead Division. The new In the Mood featured the much more effective M1 76mm gun, with better performance against armored targets. It also had “wet stowage” for its ammunition, which surrounded the 76mm rounds with a glycerine-water mixture that greatly reduced the risk of fire. The new In the Mood was in action by 1 July and Pool volunteered his tank to ride point for his unit – Company I, 3rd Battalion, 32nd Armored Regiment, part of 3rd Armored Division’s Combat Command A. He became known as the “Spearhead of the Spearhead,” always the first into battle. And there were many battles. In the Mood led the way for Lt. Col. Walter B. Richardson’s Task Force Y into repeated actions against the Germans as the 3rd Armored Division fought its way through the Normandy hedgerow country and then southward through the gap in the German lines forced at the Battle of St. Lo. Turning to the east, Pool and his crew led Task Force Y into Colombiers, a commune in Normandy’s Orne department. In the Mood nearly collided with a German Panther, which fired first and missed at point-blank range. The Panther got off a second shot and missed again before Groundhog Oller blew its turret off with his first shot. Pool had led the task force into 2nd Panzer Division’s assembly area, and he destroyed another Panther at close range as well as two armored cars in the short, sharp action. Once again, Pool and all of his Pups emerged unscathed from their tank’s destruction. Pool continued his amazing run of luck: suffering from claustrophobia, a definite handicap for a tanker, he preferred to ride totally outside the tank’s turret. When action became imminent he compromised by climbing through the commander’s hatch, but kept his upper body outside. Only rarely did he “button up” In the Mood. His driver Baby Richards imitated Pool, rarely closing his own hatch. “Pool hated the Germans and thought he could lick them all,” driver Richards explained. At Namur, Belgium, In the Mood destroyed 16 German armored vehicles in a single day. At Dison, Oller knocked out a Panther at 1,500 yards – a rare long-range kill for In the Mood – and the tank also shot up six troop-filled halftracks. The Army tapped Pool’s crew for a War Bonds tour back home, but they had one last mission to perform before leaving the front, an attempt to breach the Siegfried Line at Munsterbusch, south of Aachen. This time In the Mood did not lead but instead drew flank guard duty. Pool spotted a camouflaged German anti-tank gun and ordered his gunner to fire. A substitute loader had replaced Jailbird Boggs for this mission, so that Boggs could have his hearing checked before the trip back to the States. When the substitute rammed a 76mm shell into the breach, it jammed. Pool screamed “Back up, Baby!” and Richards shoved In the Mood into reverse but not before the anti-tank gun hit In the Mood in the turret, blowing Pool clear of the tank but shredding his right leg. Pool tried to run but collapsed, and proceeded to attempt a field amputation of the shattered limb with a syringe of morphine and his pocket knife. Meanwhile Richards, thinking Pool was still aboard and awaiting fresh instructions, continued to back up. Another shell hit the tank, and as Richardson, still their task force commander, watched in horror In the Mood reached a steep bank, toppled over the edge and landed almost upside-down. The remaining crewmen bailed out safely but Oller had also been wounded. The war was over for War Daddy and his Pups. Pool would have his leg amputated by an actual surgeon and undergo two years of difficult rehabilitation. After a short stint running a gas station, he convinced the Army to take him back despite the missing leg and he became an instructor with the Spearhead Division. After retiring in 1960 he continued to visit the division and speak with new generations of treadheads. History’s deadliest tank commander died in his sleep in 1991. Get In the Mood! Order Elsenborn Ridge right here.